"In Homelands, writers across generations, cultures familiar and unfamiliar, and from diverse classes and levels of education open a window on both the tragedies of loss and displacement and the intimate moments of acceptance at home and in the self. Read, listen, cry, sing, celebrate, and relate with these women. They are not only telling their history, they are inviting us to travel home with them—whether that place is here on earth or in the soul." 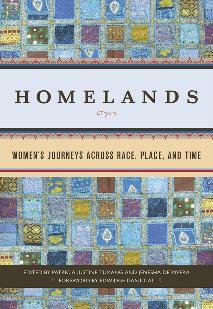 Homelands: Women's Journeys Across Race, Place, and Time, edited by Patricia Justine Tumang and Jenesha de Rivera and featuring a Foreword by Edwidge Danticat, is published by Seal Press. In this lyrical collection of poignant essays, women writers explore the complexities of immigration, war, exile, and diaspora as they seek to redefine and reclaim the meaning of homeland. Whether home is an actual geographic place, a self-defined community, a cultural heritage, or a wavering memory, Homelands reveals a truth that is known by all who have wandered from their roots: “Homeland” is far more than just a physical space. In giving voice to these different experiences of home, the women in this collection conjure up nostalgia and illuminate the triumph of the human spirit.